Kawasaki Motors Corp., U.S.A. recently announced the introduction of two all-new contingency programs for 2007. 11th annual Chaparral Pro/Am ATV MX Championships are schedule for 30-31, 2006. With the Suzuki Grand National Cross Country ATV title wrapped up, there was nothing but bragging rights on the line at the final round of the series, the Klotz Ironman GNCC. But bragging must be important, because East Coast ATV Honda’s Chris Borich and Team Yamaha’s Bill Ballance—the infamous Killer B’s of GNCC racing—battled wheel-to-wheel in perhaps the best race they have ever had together. Borich came out on top. With yet another consistent finish, Yamaha’s Bill Ballance rode his factory YFZ450 right into the ATV GNCC record books. Ballance locked up the 2006 Suzuki Grand National Cross Country ATV title at the FMF Power Line Park GNCC over the weekend, tying Barry Hawk’s all-time record with his seventh-straight GNCC number one plate. Team Suzuki/Yoshimura will be campaigning the full WPSA PowerSports Super Quad ATV Pro 450 series for the 2007 racing season. Team Suzuki/Yoshimura ATV has a new number to paint on their semi for 2007. #191 Dustin Wimmer from Center Valley, PA has officially been signed to race for the team for the next two years. 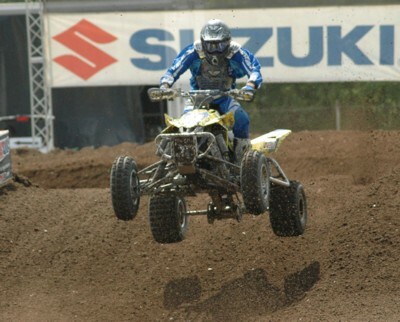 Racer Productions, producers of the Suzuki ATV Grand National Cross Country Series, announces they will run a new class at the final two rounds of racing in the 2006 season. The Moose Racing Unadilla ATV GNCC hosted yet another classic “Killer B’s” battle with Chris Borich and Bill Balance, and this time Borich appeared to have the upper hand. 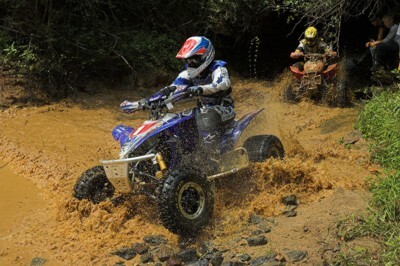 Nearly every round of the 2006 Suzuki Grand National Country ATV Series has featured incredible racing, but the Yadkin Valley Stomp might have been the best yet. It all came down to the last lap in the last race of the WPSA Power Sports ATV Series Championship. The Super Quad 450 Pro Division had been a four-way contest between Gust, Jones, Natalie and Wimmer until injuries took out Jones and Natalie. But with the ESPN cameras capturing every nail-biting moment, it was just a couple of quad lengths that separated the two would-be champions.